Click here to view Fairview’s website. Year established: 1853 (the first “daughter” of Libertyville Church which was the first congregation in Iowa). 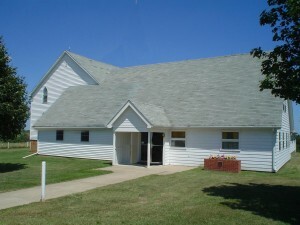 The first church building was built in 1866. It served the growing congregation for nearly 78 years. Fun fact: In January of 1944, the church building burned to the ground despite the valiant efforts of community members to fight the fire. Few items were saved from the burning structure. Among them was the picture of Jesus rescued from the fire by church member, Dwight Powell. By the time Powell went in for the picture, the smoke had thickened to where he could not see. The men on the outside kept talking to him to guide him out by the sound of their voices. The picture still hangs in the church today.